﻿﻿﻿﻿﻿Like their fearsome quills, porcupines’ range is spreading. If we took the etymological route and traced back to the 1400s, we’d call him a “prickle pig.” Centuries later, we combined the Latin word porcus, meaning pig, with spina, meaning spine, to name our modern-day porcupine, the keen and briery resident of mostly northern and western Texas. Should you find one on your neighborhood boulevard or padding its way through the backyard, here are some things to know. Porcupines won’t always be found waddling through the brush. They prefer rocky nooks and boulders, but they also do well at navigating pine and other trees. You may have to look up to spot the skilled climbers, though they weigh up to 30 pounds and are the second-largest rodent species in North America (after beavers). As members of the order Rodentia, porcupines are endowed with prominent incisors, used to pierce through to the inner bark of trees (when they aren’t foraging through ground-level shrubbery). Porcupines are not an aggressive species, but they are drawn to us. 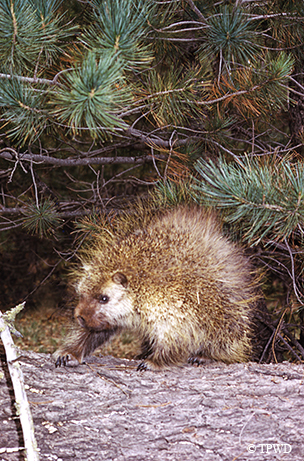 Led by their strong sense of smell, porcupines can be attracted to your musty, hand-rubbed canoe paddles or to backpack straps that absorbed sweat from your shoulders. Anything with the salty tang of perspiration acts as a porcupine magnet. If you find a porcupine parading around, there’s no need to panic. Despite the popular notion that Erethizon dorsatum will propel its dorsal spears into your nose from a yard away, a porcupine isn’t much of an assailant. Something (or somebody) has to first make contact with the rodent before its barbed hairs can loosen from their follicles and spear the opposing party. If a porcupine feels threatened, he will bristle to make his quills stand erect and swat with his tail in defense. Respect this gesture! Appreciate the porcupine from a safe distance and listen for its old-man grumble as it walks by.